The author was among the first contributors to Nupedia, Wikipedia's peer-reviewed predecessor, and to Wikipedia. He spent six years, on and off, studying Wikipedia. It is a question of time before Wikipedia self-destructs and implodes. It poses such low barriers to entry (anyone can edit any number of its articles) that it is already attracting masses of teenagers as "contributors" and "editors", not to mention the less savoury flotsam and jetsam of cyber-life. People who are regularly excluded or at least moderated in every other Internet community are welcomed, no questions asked, by this wannabe self-styled "encyclopedia". There is nothing new about the collaborative model that is Wikipedia. Before the age of Gutenberg, copyists (usually found in monasteries) used to add their notes and comments to the texts they were copying as they went alone, without indicating which is the original and which their own contributions. The Oxford English Dictionary (OED), first published in 1928, was the outcome of seventy years of combined efforts of 2,000 zealous and industrious volunteers. The difference between Wikipedia and the OED, though, is that the latter appointed editors to oversee and tutor these teeming hordes of wannabe scholars. The concept of “mob wisdom” or “crowd sourcing” is equally dated. Ancient Greek and Egyptian luminaries, from Eratosthenes to Ptolemy, relied on eyewitness accounts of travellers to compose their enduring (albeit utterly erroneous) masterpieces. The distinction between layman and expert is a modern invention, an aberration in historical terms. Even so, every scholarly article and book submitted for publication first goes through peer review: scrutiny by qualified experts who suggest additions and amendments to the material. Once published, authors frequently act on input by academics and the wider public and issue errata, revisions, and new editions to reflect this newly-gained knowledge. Wikipedia differs from traditional “out-sourcing” in that it is indiscriminate: the qualifications, education, experience, and credentials (expertise) of its contributors are frequently ignored, or even derided. Wikipedia is thus subject to the tyranny of the (often narcissistic) user or the community and their weapons: arbitrary editing, malicious smears, impersonation (sock puppetry), and other underhanded tactics. It is a meritocracy of passive-aggressiveness. Six cardinal (and, in the long-term, deadly) sins plague Wikipedia. What unites and underlies all its deficiencies is simple: Wikipedia dissembles about what it is and how it operates. It is a self-righteous confabulation and its success in deceiving the many attests not only to the gullibility of the vast majority of Netizens but to the PR savvy of its sleek and slick operators. The overwhelming majority of contributors to and editors of the Wikipedia remain anonymous or pseudonymous throughout the process. Anyone can register and members' screen-names (handles) mean nothing and lead nowhere. Thus, no one is forced to take responsibility for what he or she adds to the "encyclopedia" or subtracts from it. This amounts to an impenetrable smokescreen: identities can rarely be established and evading the legal consequences of one's actions or omissions is easy. As the exposure of the confabulated professional biography of Wikipedia Arbitrator Essjay in March 2007 demonstrates, some prominent editors and senior administrators probably claim fake credentials as well. A software tool developed and posted online in mid-2007, the Wikiscanner, unearthed tens of thousands of self-interested edits by "contributors" as diverse as the CIA, the Canadian government, and Disney. This followed in the wake of a spate of scandals involving biased and tainted edits by political staffers and pranksters. Everything in the Wikipedia can be and frequently is edited, re-written and erased and this includes the talk pages and even, to my utter amazement, in some cases, the history pages! In other words, one cannot gain an impartial view of the editorial process by sifting through the talk and history pages of articles (most of which are typically monopolized by fiercely territorial "editors"). History, not unlike in certain authoritarian regimes, is being constantly re-jigged on the Wikipedia! The Wikipedia is not an experiment in online democracy, but a form of pernicious anarchy. It espouses two misconceptions: (a) That chaos can and does lead to the generation of artifacts with lasting value and (b) That knowledge is an emergent, mass phenomenon. But The Wikipedia is not conducive to the unfettered exchange of information and opinion that is a prerequisite to both (a) and (b). It is a war zone where many fear to tread. the Wikipedia is a negative filter (see the next point). Lacking quality control by design, the Wikipedia rewards quantity. The more one posts and interacts with others, the higher one's status, both informal and official. In the Wikipedia planet, authority is a function of the number of edits, no matter how frivolous. The more aggressive (even violent) a member is; the more prone to flame, bully, and harass; the more inclined to form coalitions with like-minded trolls; the less of a life he or she has outside the Wikipedia, the more they are likely to end up being administrators. The result is erratic editing. Many entries are completely re-written (not to say vandalized) with the arrival of new kids on the Wikipedia block. Contrary to advertently-fostered impressions, the Wikipedia is not a cumulative process. Its text goes through dizzyingly rapid and oft-repeated cycles of destruction and the initial contributions are at times far deeper and more comprehensive than later, "edited", editions of same. Wikipedia is misrepresented as an open source endeavor. Nothing can be further from the truth. Open source efforts, such as Linux, involve a group of last-instance decision-makers that coordinate, vet, and cull the flow of suggestions, improvements, criticism, and offers from the public. Open source communities are hierarchical, not stochastic. Moreover, it is far easier to evaluate the quality of a given snippet of software code than it is to judge the truth-content of an edit to an article, especially if it deals with "soft" and "fuzzy" topics, which involve the weighing of opinions and the well-informed exercise of value judgments. The Wikipedia's ethos is malignantly anti-elitist. Experts are scorned and rebuffed, attacked, and abused with official sanction and blessing. Since everyone is assumed to be equally qualified to edit and contribute, no one is entitled to a privileged position by virtue of scholarship, academic credentials, or even life experience. The Wikipedia is the epitome and the reification of an ominous trend: Internet surfing came to replace research, online eclecticism supplanted scholarship, and trivia passes for erudition. Everyone's an instant scholar. If you know how to use a search engine, you are an authority. Wikipdians boast that the articles in their "encyclopedia" are replete with citations and references. But citations from which sources and references to which works and authors? Absent the relevant credentials and education, how can an editor tell the difference between information and disinformation, quacks and authorities, fact and hearsay, truth and confabulation? Knowledge is not comprised of lists of facts, "facts", factoids, and rumors, the bread and butter of the Wikipedia. Real facts have to be verified, classified, and arranged within a historical and cultural context. Wikipedia articles read like laundry lists of information gleaned from secondary sources and invariably lack context and deep, true understanding of their subject matter. Can Teenagers write an Encyclopedia? The vast majority of Wikipedia contributors and editors are under the age of 25. Many of the administrators (senior editors) are in their teens. This has been established by a survey conducted in 2003 and in various recent interviews with Jimmy Wales, the co-founder of the enterprise. The truth is that teenagers cannot do the referencing and research that are the prerequisite to serious scholarship - unless you stretch these words to an absurd limit. Research is not about hoarding facts. It is about identifying and applying context and about possessing a synoptic view of ostensibly unrelated data. Moreover, teenagers can't tell hype from fact and fad from fixture. They lack the perspectives that life and learning -structured, frontal, hierarchical learning - bring with them. Knowledge is not another democratic institution. It is hierarchical for good reason and the hierarchy is built on merit and the merit is founded on learning. It is not surprising that the Wikipedia emerged in the USA whose "culture" consists of truncated attention spans, snippets and soundbites, shortcuts and cliff notes. The Wikipedia is a pernicious counter-cultural phenomenon. It does not elevate or celebrate knowledge. The Wikipedia degrades knowledge by commoditizing it and by removing the filters, the gatekeepers, and the barriers to entry that have proven so essential hitherto. Recently, on a discussion list dedicated to books with a largely academic membership, I pointed out an error in one of the Wikipedia's articles. The responses I received were chilling. One member told me that he uses the Wikipedia to get a rough idea about topics that are not worth the time needed to visit the library. Whether the rough ideas he was provided with courtesy the Wikipedia were correct or counterfactual seemed not to matter to him. Others expressed a mystical belief in the veracity of "knowledge" assembled by the masses of anonymous contributors to the Wikipedia. Everyone professed to prefer the content proffered by the Wikipedia to the information afforded by the Britannica Encyclopedia or by established experts! Two members attempted to disproved my assertion (regarding the error in the Wikipedia) by pointing to a haphazard selection of links to a variety of Internet sources. Not one of them referred to a reputable authority on the subject, yet, based largely on the Wikipedia and a sporadic trip in cyberspace, they felt sufficiently confident to challenge my observation (which is supported by virtually all the leading luminaries in the field). These gut reactions mirror the Wikipedia's "editorial" process. To the best of my knowledge, none of my respondents was qualified to comment. None of them holds a relevant academic degree. Neither do I. But I strove to stand on the shoulders of giants when I spotted the error while my respondents explicitly and proudly refused to do so as a matter of principle! This may reflect the difference in academic traditions between the United States and the rest of the world. Members of individualistic, self-reliant and narcissistic societies inevitably rebel against authority and tend to believe in their own omnipotence and omniscience. Conversely, the denizens of more collectivist and consensus-seeking cultures, are less sanguine and grandiose and more willing to accept teachings ex-cathedra. So said Theodore Millon, a great scholar and an undisputed authority on personality disorders. Truth in advertising is not Wikipedia's strong suit. It presents itself, egregiously, as an encyclopedia. Yet, at best it is a community of users who exchange eclectic "information" on a regular and semi-structured basis. This deliberate misrepresentation snags most occasional visitors who are not acquainted with the arcane ways of the Wikipedia and trust it implicitly and explicitly to deliver facts and well-founded opinions. There is a lot Wikipedia can do to dispel such dangerous misconceptions (for instance, it could post disclaimers on all its articles and not only on a few selected pages). That it chooses to propagate the deception is telling and renders it the equivalent of an intellectual scam, a colossal act of con-artistry. Wikipedia thus retards genuine learning by serving as the path of least resistance and as a substitute to the real thing: edited, peer-reviewed works of reference. High school and university students now make the Wikipedia not only their first but their exclusive "research" destination. Moreover, Wikipedia's content is often reproduced on thousands of other Website WITHOUT any of its disclaimers and without attribution or identification of the source. The other day I visited www.allexperts.com and clicked on its "free encyclopedia". It is a mirror of the Wikipedia, but without anything to indicate that it is not a true, authoritative, peer-reviewed encyclopedia. The origin of the articles - Wikipedia - was not indicated anywhere. Consider, for instance the online and free Stanford Encyclopedia of Philosophy. Each entry is written by an expert but is frequently revised based on input from members of the public. It combines the best elements of the Wikipedia (feedback-driven evolution) with none of its deficiencies. As recent events clearly demonstrate, Wikipedia is a hotbed of slander and libel. It is regularly manipulated by interns, political staffers, public relations consultants, marketing personnel, special interest groups, political parties, business firms, brand managers, and others with an axe to grind. It serves as a platform for settling personal accounts, defaming, distorting the truth, and re-writing history. Less known is the fact that Wikipedia is potentially and arguably the greatest single repository of copyright infringements. A study conducted in 2006 put the number of completely plagiarized articles at 1% of the total - a whopping 15,000 in all. Books - from the Diagnostic and Statistical Manual, through David Irving's controversial work, down to my own, far humbler, tomes - are regularly ripped off and sizable chunks are posted in various articles, with and without attribution. The Wikipedia resembles P2P (peer-to-peer) networks such as the first incarnation of Napster: it allows users to illegally share pirated content using an application (Wiki) and a central Website (the Wikipedia). Wikipedia does not provide any effective mechanism to redress wrongs, address problems, and remedy libel and copyright infringements. Editing the offending articles is useless as these are often "reverted" (restored) by the offenders themselves. My personal experience is that correspondence with and complaints to Wikimedia and to Jimmy Wales go unanswered or stonewalled by a variety of minions. Even when (rarely) the offending content is removed from the body of an article it remains available in its history pages. Wikipedia has been legally shielded from litigation because, hitherto, it enjoyed the same status that Bulletin Boards Services (BBS) and other, free for all, communities have. In short: where no editorial oversight is exerted, no legal liability arises to the host even in cases of proven libel and breaches of copyright. But Wikipedia has been treading a thin line here as well. Anyone who ever tried to contribute to this "encyclopedia" discovered soon enough that it is micromanaged by a cabal of c. 1000 administrators (not to mention the Wikimedia's full-time staff, fuelled by 2 million US dollars in public donations). These senior editors regularly interfere in the contents of articles. They do so often without any rhyme or reason and on a whim (hence the anarchy) - but edit they do. This fact and recent statements by Wales to the effect that Wikipedia is actually regularly edited may provoke victims of the Wikipedia into considering class action lawsuits against the Wikimedia, Jimmy Wales personally, and their Web hosting company. Wikipedia is an edited publication. The New-York Times is responsible for anything it publishes in its op-ed section. Radio stations pay fines for airing obscenities in call-in shows. Why treat the Wikipedia any differently? Perhaps, hit in the wallet, it will develop the minimal norms of responsibility and truthfulness that are routinely expected of less presumptuous and more inconspicuous undertakings on the Internet. A recent (late 2006) study by Heather Hopkins from Hitwise demonstrates the existence of a pernicious feedback loop between Google, Wikipedia, MySpace, and Blogspot. Wikipedia gets 54% of its traffic from Google search results. The majority of Wikipedia visitors then proceed to MySpace or Blogspot, both of which use Google as their search service and serve Google-generated advertisements. Google has changed its search algorithm in late 2005-early 2006. I have been monitoring 154 keywords on Google since 1999. Of these, the number one (#1) search result in 128 keywords is now a Wikipedia article. More than a quarter (38 out of 128) of these "articles" are what the Wikipedia calls "stubs" (one or two sentences to be expanded by Wikipedians in the future). Between 7 and 10 of the articles that made it to the much-coveted number one spot are ... empty pages, placeholders, yet to be written! This is Google's policy now: Wikipedia articles regardless of their length or quality or even mere existence are placed by Google's algorithm high up in the search results. Google even makes a Wikipedia search engine available to Webmasters for their Websites. The relationship between Google and Wikipedia is clearly intimate and mutually-reinforcing. Google's new algorithm, codenamed Big Daddy, still calculates the popularity of Websites by counting incoming links. An incoming link is a link to a given Website placed on an unrelated page somewhere on the Web. The more numerous such links - the higher the placement in Google's search results pages. To avoid spamming and link farms, Google now rates the quality of "good and bad Internet neighborhoods". Not all incoming links are treated equally. Some Internet properties are shunned. Links from such "bad" Websites actually contribute negatively to the overall score. The top results in all 154 keywords I have been diligently monitoring since 1999 have changed dramatically since April 2006. The only common thread in all these upheavals is one: the more incoming links from MySpace a Website has - the higher it is placed in the search results. In other words: if Website A has 700 incoming links from 700 different Websites and website B has 700 incoming links, all of them from various pages on MySpace, Website B is ranked (much) higher in the search results. This holds true even when both Websites A and B sport the same PageRank. This holds true even if the bulk of Website A's incoming links come from "good properties" in "good Internet neighborhoods". Incoming links from MySpace trump every other category of incoming links. Wikipedia, the "encyclopedia" whose "editors" are mostly unqualified teenagers and young adults is touted by Google as an authoritative source of information. In search results, it is placed well ahead of sources of veritable information such as universities, government institutions, the home pages of recognized experts, the online full-text content of peer-reviewed professional and scholarly publications, real encyclopedias (such as the Encarta), and so on. MySpace whose 110 million users are predominantly prepubescent and adolescents now dictates what Websites will occupy the first search results in Google's search results pages. It is very easy to spam MySpace. It is considered by some experts to be a vast storehouse of link farms masquerading as "social networks". Google has vested, though unofficial and unannounced and, therefore, undisclosed interests in both Wikipedia and MySpace. Wikipedia visitors end up on various properties whose search and ad placement technologies are Google's and Wikipedia would have shriveled into insignificance had it not been to Google's relentless promotion of its content. This is the fifth essay I have written about the Wikipedia. Evidently, Wikipedians, Wikipedia, and Wikimedia are vehemently opposed to free speech when it is directed against them. A group of Wikipedians apparently decided to take revenge and/or to warn me off. They have authored a defamatory and slanderous article about "Sam Vaknin" in their "encyclopedia". To leave no room for doubt, at the bottom of this new entry about me, they listed all my articles against the Wikipedia. After repeated complaints and legal threats, the article was removed, though any "editor" can still write an equally-slanderous new one at any time. Additionally, I received an e-mail message from Brad Patrick, the Wikimedia's General Counsel (attorney), asking me to copy him on all future correspondence with Wikipedia, Jimmy Wales, or anyone else associated with the Wikimedia Foundation and its projects. I declined his "request". He then proceeded to ask to communicate with my lawyer since "I raised the issue of suing his client." Couldn't be subtler. I was also banned from posting to the Wikipedia - my punishment for what the Wikipedia calls "sockpuppetry" (essentially, editing articles without first logging in to one's account). It is ironic, since the vast majority of Wikipedians - including the administrator who banned me - edit articles anonymously or hide behind utterly meaningless handles and screen names. There is not a shred of proof, of course, that I have edited any article, with or without logging in. Finally, my name as well as references to my work were removed from a few articles (for instance, from the entries about the Narcissistic Personality Disorder and Narcissism (Psychology)). At least one of the "editors" who were responsible for what appears to be a vindictive act ("Danny") claims to be somehow associated with the Wikimedia's grants commission. Another editor - Zeraeph - has been stalking me and members of my support groups for almost ten years now. Q: A recent thesis published by a Spanish university states that the Wikipedia is changing some patterns and developing certain ways to increase the quality of the articles, mostly by enforcing discussion and organizational aspects… Do you still think that the Wikipedia is not an encyclopaedia? A: The Wikipedia is the massive, structured blog of an online cult. The cult is dedicated to the agglomeration of information and disinformation (i.e. data) and its classification (in the form of articles). It also revolves around the personality of Jimmy Wales and his "disciples" and, in this sense, it is a personality cult and a pseudo-religion. The only thing the Wikipedia is not is an encyclopedia. Encyclopedias are authored by people who are authorities in their respective fields; whose credentials are transparent and vetted by their peers; and who subject themselves to review by equally qualified people. The Wikipedia is authored and edited by faceless, anonymous writers and editors. The fact that they are registered means nothing as the vast majority of them still hide behind aliases and handles. Some of them have been proven to have confabulated biographies and fictitious self-imputed academic credentials. Most Wikipedia articles sport references. But references to which material? Only experts know which books, articles, and essays are worth citing from! The truth is that the Wikipedians - many of them teenagers - cannot do the referencing and research that are the prerequisite to serious scholarship (unless you stretch these words to an absurd limit). Research is not about hoarding facts. It is about identifying and applying context and about possessing a synoptic view of ostensibly unrelated data. The Wikipedians can't tell hype from fact and fad from fixture. Many of them lack the perspectives that life, experience, exposure, and learning -structured, frontal, hierarchical learning - bring with them. Knowledge is not another democratic institution, it cannot be crowdsourced. It is hierarchical for good reason and the hierarchy is built on merit and the merit is founded on learning. There is nothing new about the collaborative model that is the Wikipedia. The Oxford English Dictionary (OED), first published in 1928, was the outcome of seventy years of combined efforts of 2,000 zealous and industrious volunteers. The difference between the Wikipedia and the OED, though, is that the latter appointed editors to oversee and tutor these teeming hordes of wannabe scholars. The Encyclopedia Britannica (and online encyclopedias such as Citizendium) are going this route. Q: Your article ‘The Six Sins of the Wikipedia’ really became a reference since it was published 3 years ago. Anarchy was one of the sins you described in it. In fact, although the Wikipedia was called in the beginning a free and democratic project, after your report –and some other studies and books- Jimmy Wales and the directors stopped talking about democracy. Now they talk about the anarchy involved in all the process. Do you feel responsible for some of these changes? A. My article has been read by hundreds of thousands of people and quoted widely in many online and offline media. Yet, it is not mentioned in the very long Wikipedia article which deals with criticisms of the Wikipedia. This shows you the true nature of the Wikipedia: censorship, petty grievances, bias, and one-upmanship are rife. Not exactly the hallmarks of an encyclopedia. The Wikipedia is a veritable battlefield: many topics and personages are blacklisted and activist editors delete within minutes any mention of them. Another example: the Birther movement in the USA (people who challenge Barack Obama's eligibility to become President based on his alleged birth place in Kenya). Though a fringe group, it is sufficiently prominent to have warranted repeated references in White House press conferences. Only the Wikipedia keeps ignoring it and deleting references to it in the Barack Obama article. I do not believe that my article had any influence on the culture of the Wikipedia. Procedural matters are decided by a cabal headed by Jimmy Wales, whose grandiose cosmic-messianic vision of the Wikipedia shapes it. Wales reacts to criticism by tweaking and facelifting, not by offering fundamental changes of the model. This is because he truly adheres to the notions of creative anarchy, crowd wisdom, and emergent knowledge and because he doesn't know the differences between data (raw material, some of it relevant) and knowledge (the finished product). Q. There have been reported many errors in Wikipedia’s coverage of current news, mostly due to anonymous editors, partly fixed through the flagged edition system. Where’s the border between an encyclopedia and a website? Shouldn’t an encyclopaedia take some time to compile facts of events with some time to think and cool down the issue rather than “cover” an event? A. Most print encyclopedias publish yearbooks. Perspective is important, but so are timeliness and coverage. The difference between the Wikipedia and other encyclopedias is that the cumulative knowledge base and authoritative authorship of the Britannica, for instance, endow even its yearbook with a modicum of timelessness. Wikipedia's coverage, by comparison, is ephemeral and often misleading because the people who put it together are ignorant or prejudiced or both. Q. How would you describe the Wikipedia in relation with other encyclopaedias? A. I am an encyclopedia junkie. I collect work of reference, old and new. As far as I can judge, the Wikipedia's coverage of the natural and exact sciences is pretty good. Its humanities articles are an unmitigated disaster, though: they are replete with nonsense, plagiarism, falsities, and propaganda. I know a bit about psychology, economics, philosophy, and the history of certain parts of the world. Articles dealing with these fields are utterly and sometimes dangerously unreliable. Q. How is your relation with *Wikipedians*? Are you still one of their enemies? A. I was invited to write a few articles for the Nupedia, the Wikipedia's predecessor. When Larry Sanger, the Wikipedia's true originator, started the Wikipedia, I was among the first to contribute to it and kept on contributing to it until 2003. I have never been an enemy of the Wikipedia. I am, however, against the cult that has developed around it and the fact that it misrepresents itself as an encyclopedia. Q. Do you agree with your own points of view after three years? A. Things have improved a lot since I have written the article. The Wikipedia is less chaotic; less anonymous; the articles more rigorously referenced. But these are cosmetic changes. In the essence, the six "sins" I identified way back still stand: (1) The Wikipedia is opaque and encourages recklessness; (2) The Wikipedia is anarchic and definitely not democratic; (3) The Might is Right Editorial Principle (quantity of edits is valued over quality and relationships with other editors count more than knowledge); (4) Wikipedia is against real knowledge because it is against experts and academic "elites"; (5) The Wikipedia is not an encyclopedia and misrepresents itself as such; (6) The Wikipedia is rife with libel and violations of copyrights. Q. Do you regret of any of the six sins now that some things are changing in the Wikipedia, like the prohibition for anonymous users to edit? A. There is no prohibition on anonymous users to edit. All the Wikipedia users are anonymous to this very day. The prohibition is on unregistered users to edit. Users need to have an account and to wait three days before they can contribute new articles or make major edits. User identities are still unknown as all of them hide behind aliases and handles. I am sorry that Wales didn't have the guts to go all the way and implement a model similar to the Citizendium and the Britannica: qualified editors to review the contributions and edits of the teeming masses and make sure that the Wikipedia is not the bloody and confusing mess that it is now. A. Wikipedia members meet regularly all over the globe, in special gatherings dedicated to the "encyclopedia", its catechism and Weltanschauung, its regulatory (including enforcement and penal) mechanisms, and its future. Jimmy (Jimbo) Wales is invariably the star of such conclaves and fulfils the combined roles of prophet and Dear Leader. The Wikipedia's narcissistic co-founder deserves a special analysis: he subtly misrepresents facts (claims that Wikipedia is an encyclopedia, that he hold no special influence over it); Wales ignores data that conflicts with his fantasy world; he is above the law, including and especially his own laws (was caught editing his own Wikipedia entry, for instance); talks about himself in 3rd person singular; minimizes the contributions and role of others (such as the Wikipedia's real visionary, Larry Sanger); has a messianic-cosmic vision of himself and his life; sets ever more complex rules in a convoluted world of grandiose fantasies with its own language (jargon); displays false modesty and "folksiness"; sublimates aggression and holds grudges; and, all in all, is an eternal adolescent (his choice of language, peripatetic pursuits). Wikipedia is its founder writ large: narcissistic, autistic, solipsistic, and puerile. A. Authoritarian-totalitarian bureaucracies are marked by strict, rigid adherence to sacred texts - both foundational and exegetic - and by the blind and ruthless implementation of codified, arcane rules of conduct. The use of acronyms and ciphers singles out the initiated and separates them from the hoi polloi. The Wikipedia's holy scriptures are strewn all over its Website, mainly in the Help and FAQs sections. Yet, though accessible, they are largely incomprehensible at first sight. They require months of learning and are ambiguous. This ambiguity requires frequent intervention and interpretation by a tiny self-imputed elite, equivalent to the priesthood in established religions. The decisions of these arbiters are often final and, in many cases, arbitrary. This gives them enormous power which they use intentionally to drive away competition by alienating contributors (especially experts and scholars) and intimidating newcomers (who are often regarded as potential troublemakers). Cult leaders are narcissists who failed in their mission to "be someone", to become famous, and to impress the world with their uniqueness, talents, traits, and skills. Such disgruntled narcissists withdraw into a "zone of comfort" (known as the "Pathological Narcissistic Space") that assumes the hallmarks of a cult. The cult's leader acts in a patronising and condescending manner and criticises often. He alternates between emphasising the minutest faults (devalues) and exaggerating the talents, traits, and skills (idealises) of the members of his cult. He is wildly unrealistic in his expectations – which legitimises his subsequent abusive conduct. The participants in the cult are hostile to critics, the authorities, institutions, his personal enemies, or the media – if they try to uncover his actions and reveal the truth. The narcissist's cult is "missionary" and "imperialistic". He is always on the lookout for new recruits. He immediately attempts to "convert" them to his "creed" – to convince them how wonderful and admirable he - and, by extension, the cult - is. Often, his behaviour on these "recruiting missions" is different to his conduct within the "cult". In the first phases of wooing new admirers and proselytising to potential "conscripts" the narcissist is attentive, compassionate, empathic, flexible, self-effacing, and helpful. At home, among the "veterans" he is tyrannical, demanding, wilful, opinionated, aggressive, and exploitative. Hence the narcissist's panicky and sometimes violent reactions to "dropouts" from his cult. There's a lot going on that the narcissist wants kept under wraps. Moreover, the narcissist stabilises his fluctuating sense of self-worth by deriving Narcissistic Supply (adulation, admiration, attention) from his victims. 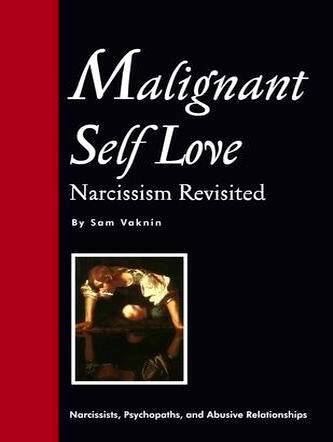 Abandonment threatens the narcissist's precariously balanced personality. Q. Are there other 'cults' or splinter groups Wikipedians consider rivals (or heretics)? A. The Internet is overflowing with stories of former Wikipedians. They all claim to have been punished and mistreated following their "heresy" and "desertion". I can only recount my personal experience with any certainty. When I left the Wikipedia, I wrote a widely-read article titled "The Six Sins of the Wikipedia". It provoked heated debate and I became the target of Wikipedians the world over. I was on the receiving end of threats and mail bombs; the pages of my books in Amazon were flooded with bad reviews; I was vilified and subjected to an Internet-wide smear campaign, replete with defamatory and libellous statements; my work was plagiarized in various Wikipedia articles and repeated requests to remedy the situation were denied; my entry in the Wikipedia was deleted (after I threatened Wales and his cohorts with a class-action lawsuit). I do not believe that this was a coordinated, concerted, condoned, or centrally-directed onslaught. But, it does reflect the extreme fanaticism and aggressive intolerance of the cult. Q. Is the Wikipedia an encyclopedia in any sense of the word? A. I don't think it's crucial that everyone agree on whether Wikipedia is or is not an encyclopedia. What's important is that people who might use it understand what it is and how it differs from the reference works they're used to. Wikipedia allows anyone to write and edit articles, regardless of their knowledge of the subjects on which they're writing, their ability to write, or their commitment to truth. This policy has allowed Wikipedia to grow large very fast, but it's come at a price. The price is that many of its articles are inaccurate, poorly written, long and bloated, or laden with bias and spin. Despite what some people would like to believe about Wikipedia, that its system is self-correcting, many inaccuracies remain for long periods of time, new ones are added, and, judging from quite a few media reports, sound information posted by people knowledgeable on a subject is often undone by others who know nothing about it. This is a natural result of the way Wikipedia is put together, its willingness to let anyone write and edit and unwillingness to give precedence to people who know what they're talking about. People who use Wikipedia should be aware of these liabilities. Q. The Britannica used to be freely accessible until it was converted, a few years back, into a subscriber-only resource. Do you regret this decision? Perhaps if the Britannica were to provide a free authoritative alternative to the Wikipedia, it would still be the first stop of seekers of information online? A. We don't regret the decision to charge a subscription fee for the premium portions of Britannica Online. Today our site has thousands of free articles, and those who subscribe to our premium service pay a fraction of what it cost for access to a high-quality, reliable encyclopedia only a few years ago. About a hundred million people worldwide have access to the Encyclopaedia Britannica online, through schools, libraries, and universities, and they don't pay for it at all. Q. "Nature" compared the Wikipedia to the Britannica and resolved that both suffer, more or less, from the same rate of errors. You hotly disputed these findings. Can you elaborate? Q. Peer-reviewed, professionally-edited reference works do have their shortcomings (elitism, conservatism, lack of pluralism, limitations of information available to the scholars involved). "Egalitarian" communal efforts like the Wikipedia do unearth, at times, data not available in "old-fashioned" encyclopedias. Moreover, the Wikipedia offers a far wider range of coverage and real-time updates. Can't it complement the Britannica? Can't the two even collaborate in some ways? A. It's a myth that professionally edited reference works are limited or elitist. On the contrary, using a rigorous editorial method that draws on people who have spent their lives mastering their subjects produces an excellent balance in perspective. We always direct our contributors to include all major controversies in their surveys of a subject, whether those points of view are fashionable or not. This approach produces good articles for lay readers, who are the people who use encyclopedias. When the work is done by volunteers who aren't adept at this kind of work, the results often settle into a comfortable consensus that favors the viewpoint in vogue among the group of people doing the work. Usually, it's the people who are trained and experienced in going beyond their own points of view that manage to do it well.